After reading this story and seeing the magnetic chart, my daughter hurried to the kitchen to set up the chart and eat more fruits and vegetables! My preschooler and I really enjoyed Kia Robertson’s book about five kids who “didn’t eat right/ No fruits and veggies… not even one bite!” Each of the kids has difficulties such as lack of focus at school, eating too much junk food, having little energy, and getting sick until they begin eating more fruits and vegetables to help them feel better. Although I had heard of “eating the rainbow” before, this was a simple, clear explanation for kids and adults to begin the process of eating better by increasing their intake of colorful (red, orange, yellow, green, and blue/purple) fruits and vegetables. I did wonder why Robertson did not include the white fruits and vegetables (besides the fact that white is not typically found in rainbows) since it is included on many other lists and white fruits and vegetables also contain many health benefits. As a vegetarian family, we probably eat enough fruits and veggies but this is a great reminder to add variety to our diets and an easy and wonderful way to track whether we truly are eating enough of them. The rhythmic rhyming sentences were catchy and incorporated the word “phytonutrients” with a brief explanation that this is what gives fruits and veggies their color and makes you healthy. I also liked that the kids in the story began eating better “one bite at a time,” reminding parents and caretakers that change can be challenging unless done in small increments. I highly recommend the chart or making your own version along with the book because it gives kids (and adults) a concrete, fun way of tracking their progress. Robertson includes additional information at the back of her story with more detail about phytonutrients, ten tips for helping your kids eat more fruits and veggies (such as modeling healthy eating for your kids), as well as a website www.todayiatearainbow.com with more information and details. The illustrator Cecilia Mariano did a wonderful job of depicting the expressions of a diverse group of kids. The illustrations are cute and colorful and the end-rhyme words are highlighted in red, making it easier for kids to participate in reading the story. Sadly the book does not actually refer to any of the colors in the rainbow, which might help younger kids with color recognition. Robertson does make subtle reference to the colors by starting each kids’ name with the beginning of each of the rainbow colors (Ruby for red, Owen for orange, Yoshi for yellow, Gabby for green, and Pippa for purple) but it was so underplayed it does not have any significant role in this story. Perhaps it will in the next Rainbow Bunch story. The magnetic chart however, could be used as a learning tool for colors, shapes, and counting since the pieces include solid colors in simple shapes such as circles and stars. The purple of the magnet actually looks a bit blue, but otherwise the magnets work as a great tool/game. The encouraging, gentle approach to introducing more fruits and veggies to kids works well in this story, especially for those new to eating fruits and vegetables but I think parents can also do more research on healthy eating. There is no suggestion for recommended serving sizes in this book and the website promotes a non-specific “‘just a little’ helpings” to start kids eating more fruits and veggies. Adult portions are very different than children’s portions and even child serving sizes vary by age, body size, and physical activity (a very rough guide to portion size is how much a child can fit in the palm of their hand). The Rainbow Bunch only covers fruits and vegetables but parents should also learn about portions for balancing the rest of the child’s diet and Physicians Committee for Responsible Medicine has a meal planning section with listed portion amounts organized by age, specifically for raising vegetarian kids. Perhaps the next series could be the “Grainbow” Bunch and cover the healthy aspects of eating whole grains! Parents may also want to consider the benefits of organic and local foods, especially the “dirty dozen” and the “clean fifteen” which refer to which produce has the most and least pesticides. The book seems primarily geared towards the toddler/preschool set and that may be why it does not mention options such as juicing and homemade smoothies to help older kids achieve their daily portions of fruits and vegetables. 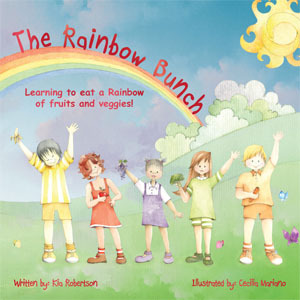 Targeted towards children ages 3+, this is a great start to healthier eating habits and I look forward to the next Rainbow Bunch book Robertson is writing. I’ve also known about the colorful diet for some years. It is a simple premise, but it really works. I’ve learned more about it from the book Full: A Life Without Dieting by Dr. Michael Snyder. He states that the satisfaction of a meal is what we should focus on rather than what foods we need to abstain from.